The Nokia Asha 501 is a phone targeted at people who do not like too much hassle with the phone and want things simple. Samsung recently launched the Galaxy Star Duos, which poses as a competitor to the former. Both devices have their own pros and cons, and many people might be confused as to which one would suit their usage pattern better. You can expect the Asha 501 to have a smoother UI, while on the other hand, the Galaxy Star Duos comes with Android, and we all know what Android is capable of. If you’re one among the people who are confused, read ahead, as we compare both the phones based on their specs. Both, the Galaxy Star and the Asha 501, feature 3 inch display panels, with the same resolution of 320×240 pixels. We calculated the PPI to be almost 133ppi, which means there will be nothing exceptional in both the display panels. This clearly means that the phone is not meant for gaming and/or multimedia usage, since all those activities on such small displays will be a pain rather than pleasure. Having said that, let us also tell you that the phones belong to a completely different category altogether; the phones are targeted at (i) people having a very limited budget and do not want to go for domestic brands, and (ii) people looking for a decent secondary phone without too many features and good battery life. There has been no mention of the type/frequency/brand of the CPU on the Asha 501, but we believe it is a 1GHz single core processor. The Star Duos on the other hand, features a Cortex A5 based 1GHz processor. The Asha 501 comes with just 128MB on-board memory, but the good thing here is that the phone also comes with a 4GB microSD card in the box. The Asha 501 can take microSD cards of up to 32GB. As far as internal memory on the Star Duos is concerned, the phone packs a much better 4GB of ROM which can be extended up to 32GB just like the Asha 501. On the camera front, the Asha 501 wins the battle thanks to the 3.15MP rear camera which can take photos of up to 2048×1536 pixels in resolution. The Star Duos falls behind with just a 2MP fixed focus camera. This means that the Asha 501 will prove to be quite a bit better in terms of camera. Both phones lack a front camera which is quite understandable, given the price bracket in which both these phones feature. 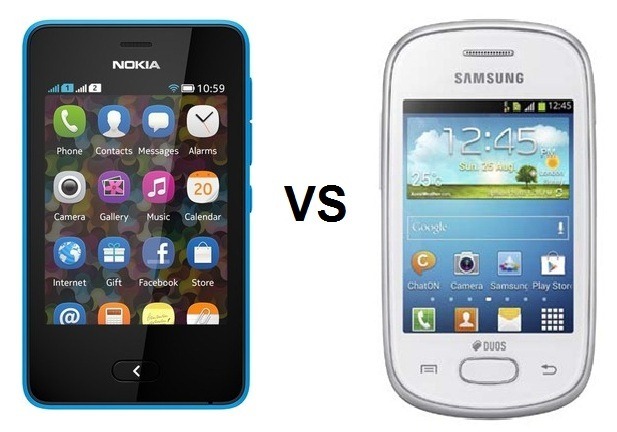 Similarities between these two phones do not end with screen size, screen resolution, etc. Both the phones feature the same 1200mAh battery, but given the behaviour of Android, you can expect the Asha to last about 1.5 times more than the Star Duos on one single charge. This is because the OS on the Asha 501 is much more optimized to handle the hardware than Android, which cannot be as highly optimized because the same OS is used in a variety of devices ranging across different manufacturers. Both phones again, are dual SIM dual standby devices. The Asha 501 offers a hot-swap option which lets you change 1 of the 2 SIMs without even turning the device off. Another pro on the Asha 501 is the promise of 17hrs of talktime, which means the phone will easily last 2 days on one charge. Both are good devices; offer decent hardware at great prices. The Asha 501, however, stands out thanks to the better camera, better build and much better battery life. Given the purpose of these phones, which is to serve as a secondary phone, we would definitely pick the Asha 501 over the Star Duos, for the same reasons we mentioned above. Although the lure of Android on the Star Duos is difficult to resist, the Asha 501 would be the more practical and wise choice. The case might be a little different for someone looking for their first phone, where the Star Duos would be the first choice since it would also let the user have a taste of Android flavours. I was confused in between these 2 phones. Thanks for the great comparison. I am not going to use multiple apps or games. Mainly for the usage of calls and battery am getting. So, what Can I go for? yes nokia asha 501 is great device – it fulfills both of these requirements.